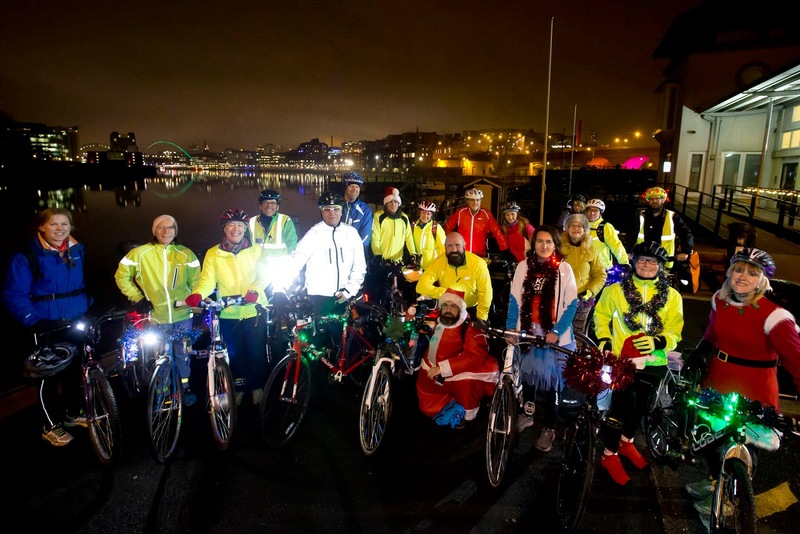 The Cycling in the City Halloween ride had been a great success so we thought we’d try a Festive Fun ride nearer to Christmas time. A quick visit to Poundland (what did we ever do before Poundland?) resulted in the purchase of lots of lights and tinsel and beads and shiny things to ‘bling up the bikes.’ We hoped that it wouldn’t rain. 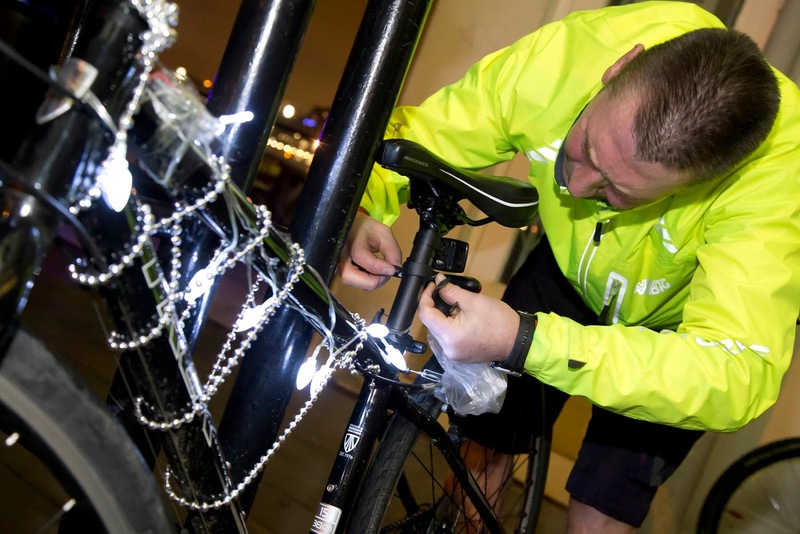 Our plucky participants began to arrive at the Cycle Hub and we set about sticky taping lights and sparkly things onto frames and crossbars. 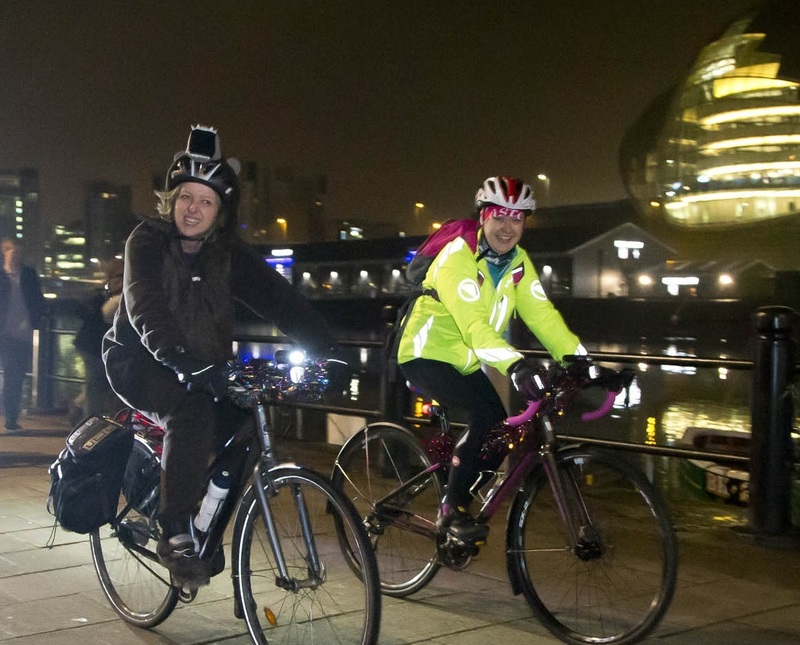 My Trek bike – a very nice machine – was looking bare so Fay helped me out with her artistic skills and Les, one of our ride leaders, put some more lights on so I could see and be seen in the dead of night. Well it felt like the dead of night, it was actually six o’clock. 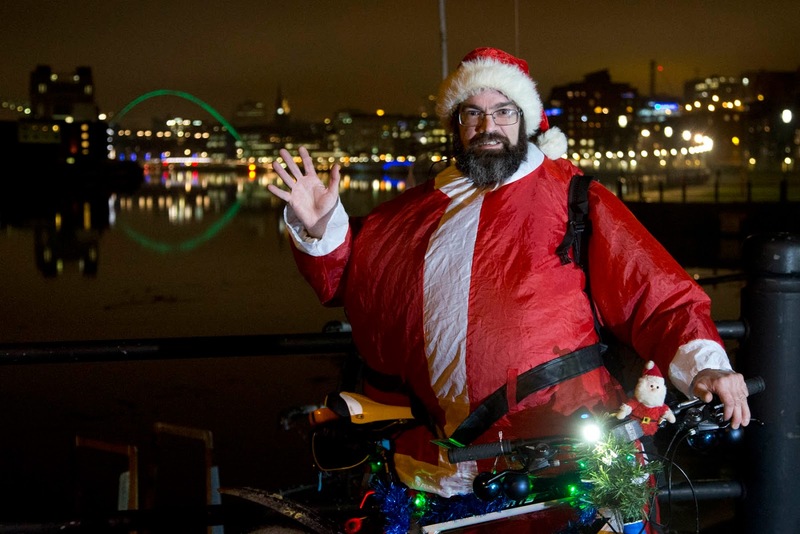 Newcastle Councillor Ged Bell judged the bikes for us and gave out a few prizes including one to our amazing cycling Santa Claus. Ged gave a short speech about how he thought it was important to support more cycling in our city and make it easier and safer for cyclists, which I thought was a really nice touch. 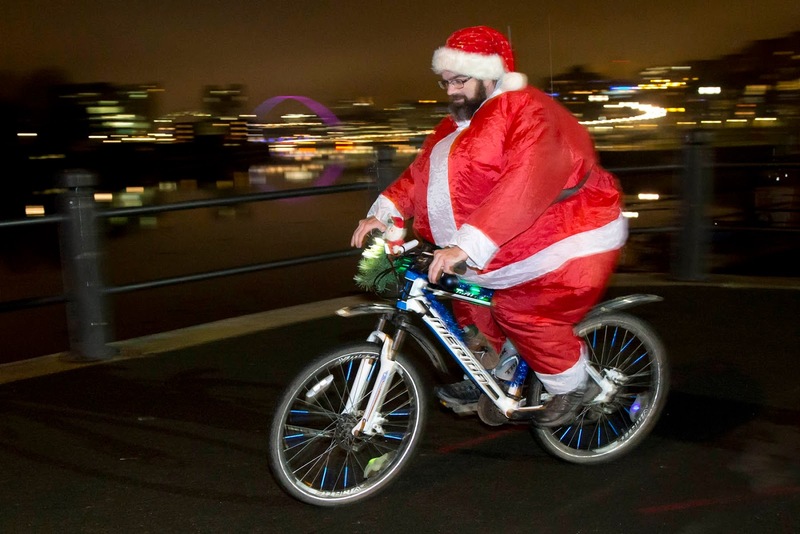 Our Cycling Santa, Andrew Spencer, had really gone to town on his outfit and bike. Andrew had brought his own electric pump to inflate himself and also had a speaker in his backpack which blasted out Christmas songs as we rode along. Awesome. 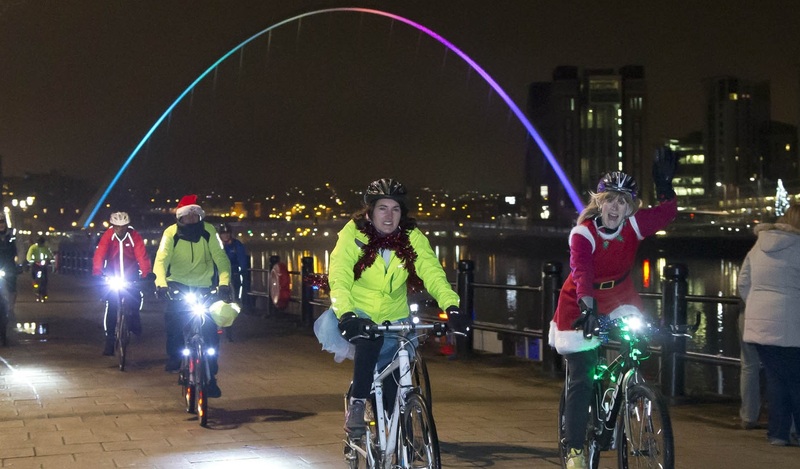 We set off along the Newcastle Quayside which was looking its usual beautiful self with the Millennium Bridge illuminated in rainbow colours, and headed right past the city centre along through the riverside business park to the Scotswood Bridge. We did have to keep stopping a bit as members of the party fell victim to the odd puncture – apparently it is the puncture season. Helpfully there’s always someone carrying a spare inner tube at these events and an expert on hand to replace it. We did do some singing of Christmas songs, but on the twelve days of Christmas everyone always gets a bit mixed up at about the ninth day – or even earlier. Rudolph the red nosed reindeer was an easier hit. The route has some very dark bits and there were a few of those pesky bollards which are designed to create collision I’m certain. There was the occasional sharp corner and short steep bank, but they were negotiated without incident. We crossed the mighty river Tyne a few times it seemed to me, and finally we came back across Dunston Staiths and cycled along the Gateshead side of the river which is a brilliant cycle path. From this side we were able to see the huge Copthorne Hotel all lit up and the High Level bridge also flashing in a coloured light sequence. I hadn’t realised it did that. 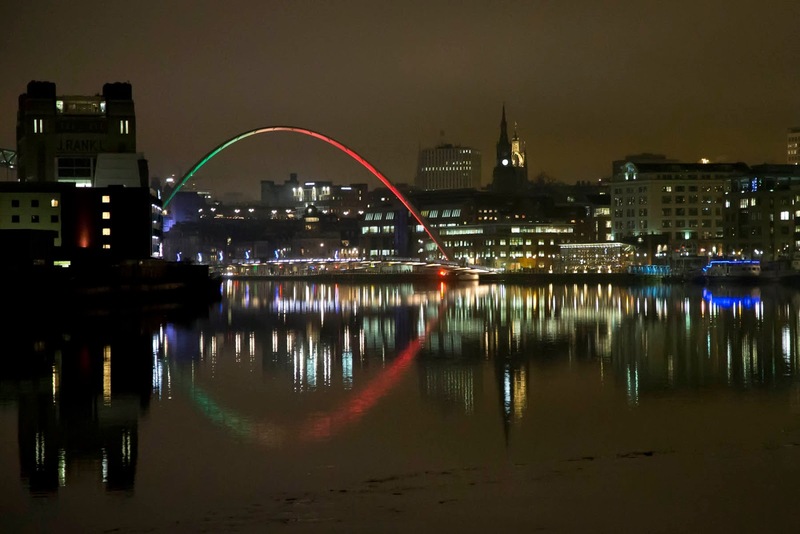 Seeing the seven bridges of the Tyne lit up at night is a unique and stunning sight and not one many cities can match.